With the price of gold still relatively high (at least compared to what it was a few years ago), many people think that jewelry could be a good investment. And it doesn’t even have to be gold jewelry. Silver has been on the rise in recent years as well — and it’s more affordable. And many people tout the lasting value of precious gemstones, especially diamonds. It seems as though jewelry is a good bet, since many feel that it is bound to appreciate in value over time. It’s portable: Jewelry is portable. It’s easy to stores at home, unlike bullion. Even coins can be more difficult to store. Jewelry is often small and light. It can be stored in a safe, and it can easily be carried away if you have to leave in a hurry. It’s tangible: For many, true value is found only in the tangibles. Many people like to have something that they can touch, and that has what many consider tangible value. To those who believe that precious metals and stones have tangible worth, jewelry feels like a much safer bet than relying on a fiat currency. It holds value: Even if it doesn’t appreciate in value, many people expect jewelry to at least hold its own in terms of worth, especially gold jewelry. If you are someone who believes in the appreciating value of metals, and in the worth of something tangible, it might be tempting to view jewelry as a good investment. However, you need to be wary; the reality is that jewelry doesn’t always appreciate in value. Unfortunately for many, the truth is that investing in jewelry is a lot like investing in collectibles: If you don’t buy the rarities, or the high quality, it can actually depreciate in value over time. Jewelry is mass-produced just like many so-called collectibles are. And, there is plenty of low-quality jewelry out there that just doesn’t hold its value, much less appreciate. You need to be on the look out for these situations. First of all, it’s important to realize that many pieces of jewelry, pretty as they are, might not actually have significant amounts of gold or silver in them. Some pieces are only plated with a precious metal, and might have a lesser metal underneath. Other pieces might be mixed with other metals, reducing the amount of pure gold or silver. This is especially prevalent with gold. If you buy something that is only 10-karat or 14-karat gold, the “melt” value is going to be much lower than you probably expect. Trying to get more for your gold is very difficult if you are selling a rather generic piece that is likely to be good only for melting down. Markup: When you buy jewelry from a retailer, it is usually marked up quite heavily. Markups in the jewelry industry are only rivaled by mark ups in the furniture industry. Even if you get something “on sale,” it is still likely being sold at a significant mark up. Size and quality of the stone: Another factor is the size and quality of the stone in a piece of jewelry. A small diamond or other precious stone is much less likely to appreciate than a large one. Quality matters too: A high quality stone is always much more valuable than one with low quality. History: What’s the history behind the piece? A famous piece of jewelry, or one that was crafted by a master, or a respected designer (think Harry Winston), is more likely to retain its value, and even appreciate. On top of that, a piece of jewelry owned by someone famous is likely to be more valuable. However, most “regular” investors don’t have access to these types of pieces. Rarity: As always, uniqueness plays a role in how valuable something is. The rarer a piece of jewelry is, the more likely it is to appreciate in value – assuming fine craftsmanship and high quality materials. In the end, someone looking to collect jewelry as an investment is likely to be disappointed. You’re better off buying what you like, and getting the best quality you can afford. That way, it can increase in sentimental value, and maybe become a cherished heirloom, even if it never funds your retirement. Jewelry was a GREAT investment if you were buying gold chains in bulk in 2002. 🙂 Right now? Not a chance. I think it depends when you buy it. If you bought a piece of gold jewelry when gold was $1,800 an oz, you have a problem. 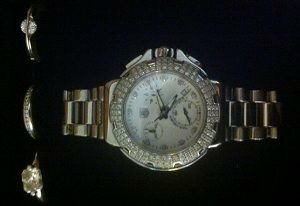 If yo buy certain high quality watches where the watch itself determines value, it may be a better deal. I would want to learn a lot about buying jewelry before I would do this though.